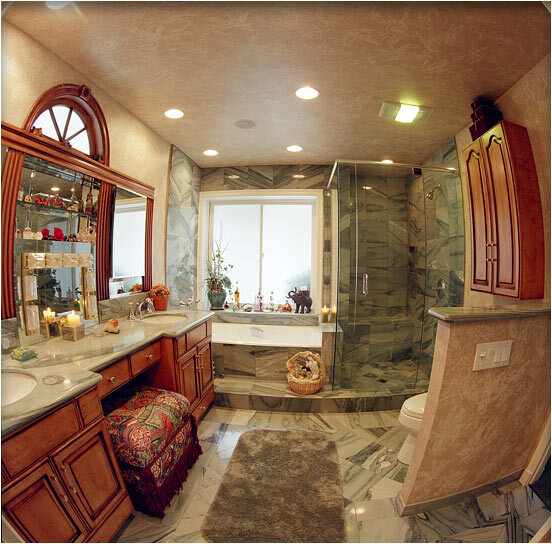 Smaller Project 1-1, Bathroom Remodel » Roger Perron Inc. This Beverly Hills bathroom remodel was completely redesigned to provide a better floor plan for the master bathroom and walk-in closet (photograph was taken with a fish-eye lens). The maple cabinets are distressed and stained with antique finish. The special mirrors with circular window layout provide an interesting look. The marble tile and countertop blend with the decor. Roger Perron, design-build contractor, designed the remodeling plan and details for this Beverly Hills home, and Marilyn Brown created the interior design.